A brownfield is any property where development or reuse may be complicated by the presence or potential presence of a hazardous waste, petroleum, pollutant, or contaminant and typically include properties historically used for industrial and commercial operations. The New York State Brownfield Opportunity Areas (BOA) program offers grants to local governments and community groups to develop area-wide revitalization strategies for neighborhoods or areas affected by brownfields or economic distress. Brownfield Clean-up Projects located in a designated BOA are eligible for additional incentives under the New York State's Brownfield Clean-up Tax Credit Program, as much as 5% of the Tangible Property Tax Credit. For most of the 20th century the South Buffalo Brownfield Opportunity Area (SBBOA) was primarily home to steel plants and associated industries. Located in close proximity to the urban core and well-serviced by existing infrastructure and a variety of transportation modes, the South Buffalo BOA presents a tremendous redevelopment opportunity for the City of Buffalo and the Buffalo-Niagara region. Over the next several decades, this area will be transformed into a mixed-use community near the shores of Lake Erie and the Buffalo River. Located in close proximity to the urban core and well-serviced by existing infrastructure and a variety of transportation modes, the SBBOA presents a tremendous redevelopment opportunity for the City of Buffalo and the Buffalo-Niagara region. The City of Buffalo and BUDC have been engaged with the South Buffalo community for the past several years to prepare a set of revitalization strategies and projects for this BOA. 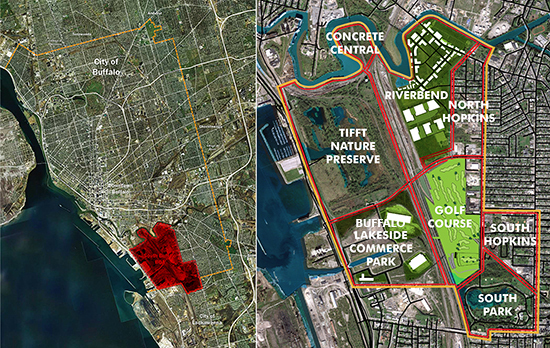 The vision is that this 2,000 acre waterfront site will be transformed into a mixed-use community near the shores of Lake Erie and the Buffalo River and become a focus for a new, green economy over the next several decades. This strategy was developed over a series of efforts described below, with links to reports and plans prepared under those work efforts. Since completion of the Step 2 Nomination Study in 2009, the City of Buffalo and Western New York region have experienced a resurgence in investment in the City of Buffalo and Western New York region. The Implementation Strategy, completed in 2014, analyzes and updates the planning work that was completed during previous studies and updated strategies were developed to complement current city trends and support the community vision. Updated land use plans were reviewed with stakeholders and these changes were incorporated into the City of Buffalo's Green Code. Strategic sites within the study area were identified and outreach to landowners took place to determine future investment plans for their property and garner interest in understanding the environmental conditions that may exist. Throughout the study, small, medium and large implementation projects were identified and discussed with the community and potential project champions. The Implementation Strategy builds off the success of initiatives implemented across the city and provides a comprehensive strategy with varying scale, cost techniques, time frames and actions required to achieve the community's desired vision. The documents prepared under both the Step 2 Nomination Study and Step 3 Implementation Strategy provides the City of Buffalo with a complete strategy to submit to the New York State Department of State for designation of this are as a Brownfield Opportunity Area. An approved BOA demonstrates the importance of this area while providing additional funding opportunities and incentives for property owners. A draft Executive Summary for the South Buffalo BOA Step 3 Implementation Study can be found here (SBBOA Step 3 Executive Summary). The full draft South Buffalo BOA Implementation Strategy can be found here (SBBOA Step 3 Final Implementation Strategy). This work is described in more detail below. RiverBend was identified as one of the strategic development opportunities during the Step 2 Nomination Study. The former Republic Steel and Donner-Hanna Coke facility was purchased by BUDC in 2008. The RiverBend Master Plan, completed in 2012, proposes a sustainable mixed-use development with a multi-modal transportation system and a holistic approach to the site's ecology. The Master Plan is based on themes to Connect, Restore, Transform, and Engage with an emphasis on the creation of a regional asset. The Green Infrastructure Plan, a component of the overall Master Plan, makes several recommendations that have already been implemented while others are in the planning phase. Since the release of the RiverBend Master Plan, Governor Andrew M. Cuomo announced the creation of the Buffalo High-Tech Manufacturing Innovation Hub at RiverBend (2013), a major economic development strategy of the "Buffalo Billion." Since the initial announcement by Governor Cuomo, SolarCity's purchase of Silevo - one of the initial companies expected to locate in the Hub @ RiverBend -- has resulted in a four-fold increase in the size and scope of the project. The Hub is now a $1.25 billion economic development project that will result in the largest solar panel manufacturing facility in North America, producing over 1 gigawatts of solar panels annually and employing over 1,500 people on site, as well as another 3,500 people throughout New York State in supporting companies -- will be located in the South Buffalo BOA with the creation of the. A copy of the RiverBend Master Plan can be found here RiverBend Master Plan. The RiverBend Green Infrastructure Plan can be found here RiverBend Green Infrastructure Plan. The RiverBend Design Guidance can be found here RiverBend Design Guidance. As part of the South Buffalo BOA Implementation Strategy, the City of Buffalo and BUDC commissioned an assessment of the regional indoor and outdoor recreational sports facility market. The study's analysis, completed in 2015, indicates a pent up demand for a major sports complex within or adjacent to the South Buffalo BOA. Based on predominant user group needs, and requirements that were generated through the market supply and demand sections interview process, a set of preliminary base case facility parameters were developed, and included construction cost estimates, financial operations analysis and an economic impact analysis for the potential facility. As part of this assessment, the study also evaluated existing recreational facilities throughout the City of Buffalo. The study is being distributed to sports facility developers throughout WNY and the US. A copy of the report can be accessed here (SBBOA Recreational Needs Report). With improved connectivity and leveraging the information in the South Buffalo BOA plan, Buffalo Museum of Science management renewed the efforts to develop and expand this unique regional resource. In 2010, the Museum of Science was awarded a grant from the Niagara River Greenway Commission's Buffalo and Erie County Standing Committee to stabilize and add energy efficient enhancements to the existing cabin and education center. It is one of the few local organizations that can tell the story of the Great Lakes due to the proximity of its facilities to Lake Erie and can make significant connections to other natural areas within the South Buffalo BOA and beyond. As part of the South Buffalo BOA Implementation Strategy, BUDC commissioned an environmental assessment of the former Lehigh Valley Railroad property that borders Tifft Nature Preserve to the east and south. The environmental assessment provided some base case information for potential expansion of the Nature Preserve. In addition, the BOA also provided for some initial design efforts for expansion and upgrading of the Tifft Education and Visitor Center, to create a more sustainable facility. Schematic plans for the Center can be obtained here: Tifft Phase I Rendering & Tifft Building Schematic Plan.